CGI Off Campus Drive in Bangalore, Hyderabad,Chennai,Mumbai On 24th May 2014. 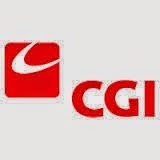 CGI Job Openings For Associate Software Engineer Position. Only 2013 Batch Freshers are eligible to attend this off campus drive. Minimum of 60% in 10th and 12th and 65% in graduation. The Last Date is 21st May 2014 and Walkin date is 24th May 2014. You are expected carry your certificate of training on the event date. Failure to do so will disqualify you and you shall not be allowed to participate in the drive. Candidates are willing to work at any of the CGI locations from where either CGI or any of its clients operate or function. Candidates are willing to work in IT – Development, Maintenance, Support or Testing groups of CGI that are already in existence or may be established/constituted in the future as part of its business/operational diversification or growth. Candidates should be flexible to work in any kind of shift – day or night, as applicable to my process as assigned to me without any obligation or bindings, that I am being assigned/allocated.